From the moment the great Archimedes leapt from his bath yelling "Eureka! ", slipped on the soapy floor and ruptured his spleen, inventors have been injuring themselves. 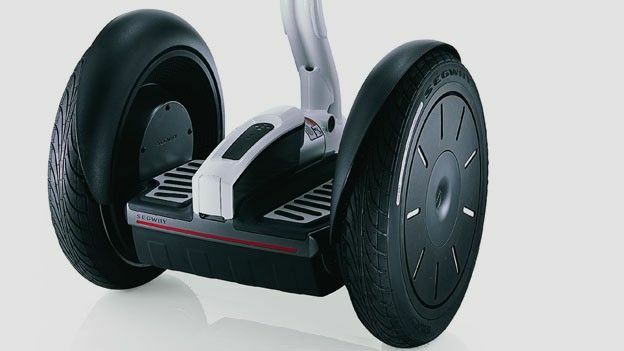 The latest, Segway firm owner Jimi Heselden, met his maker after he failed to keep control of his high-tech two wheeler, leading to him riding off a cliff and into a river. Otto Lilienthal, known as the German Glider King, set out in one of his own gliders on August 9 1986. Sadly his gliding reign came to an abrupt end as he fell 17 metres, breaking his spine in the process. On his death bed one day later, Lilienthal uttered his final words: "Small sacrifices must be made." What, for the greater good of gliding? Now that's a true enthusiast. eurekaaaargh! Russian physician Alexander Bogdanov pioneered blood transfusions in the 1920s, believing them to be the secret of eternal youth. In 1928 he received his 11th and final transfusion, from one of his students. Sadly, said student was suffering from both malaria and tuberculosis and Bogdanov promptly dropped dead. Another partial success, then. Marine engineer HL Hunley developed the first hand-powered submarine and named it, immodestly some might say, after himself. In 1863, he took command of the vessel during a routine training exercise. Needless to say, it sank, killing all eight members of the crew and Hunley himself. American engineers Hal Blake and Henry Smolinski had a crazy dream. They wanted to build the first flying car, so they bolted the wings of a Cessna light aircraft to the roof of a Ford Pinto and fitted it with cabin controls. The flying Pinto would transport owners to airports, where they would detach the wings and drive merrily away. After two years of development, they got the flying car, The Mizar, into the air. Once aloft, the wings came off, leaving Hal and Henry hurtling towards the ground in a pimped out Ford Pinto. In 1903, 18 years after Gottlieb Daimler and Wilhelm Maybach built the first motorcycle, William Nelson, an employee of General Electric and amateur inventor, designed and built his own motorised bicycle at home. He considered it to be one of the most powerful bikes of its day. Sadly he was all too correct, as became apparent when it propelled him straight off a cliff as he took it for a spin one sunny afternoon. "Killed by his own invention," said The New York Times. At Pendine Sands, Wales, in 1927, motorracing driver and engineer John Godfrey Parry-Thomas attempted to regain his world land-speed record from Sir MalcolmCampbell, who had broken it weeks earlier. Parry-Thomas was suffering from a nasty bout of flu at the time, but soldiered on, and a bout of the sniffles soon proved to be the least of his worries. The exposed chains connecting the engine to the wheels of his car, named Babs, broke at 170mph, hit Parry-Thomas in the neck, and decapitated him. English engineer Henry Winstanley began work on the first Eddystone Lighthouse, near Plymouth, in 1696. He completed the project three years later and had such unwavering faith in his building he voiced his wish to be inside the lighthouse during "the greatest storm there ever was". During what became known as The Great Storm of 1703 the tower was entirely destroyed during repair work... with Winstanley and five others still inside. Be very careful what you wish for is the moral here, we imagine. Irish-born businessman and master shipbuilder Thomas Andrews Jr was managing director of Harland and Wolff in Belfast and managed the construction of the RMS Titanic. We all know this story isn't going to end too well. Andrews Jr's design didn't allow the bulkheads of the ship to be sealed off once it started leaking. That critical miscalculation, and a giant iceberg, led to the deaths of 1,516 passengers, including Andrews Jr. Since man could walk, he's longed to reach for the skies. Nobody felt the desire to soar like a bird more than Austrian tailor Franz Reichelt (1800s-1912), who designed an overcoat that would float its wearer to the ground, in the manner of a parachute. Standing on the first deck of the Eiffel Tower, then the world's tallest building, Franz showed off his fashionable, flying invention. In front of an expectant crowd and the press, he stepped off and softly wafted to the ground, landing completely safely. No, of course he didn't; he plummeted to his demise. Want proof? Type "Franz Reichelt" into YouTube. American chemist Thomas Midgley (1889 - 1944) invented both leaded petrol and CFCs. Not only were they harmful to the planet, they also led to Midgely contracting polio and lead poisoning. Ever resourceful, the disabled and bed-bound Midgely constructed an elaborate system of pulleys and ropes to lift himself from his repose. One day he duly strangled himself on one of the ropes. Sometimes, you just can't win.